i'm a traditional muzzle loading blackpowder shooter, fly fisherman, outdoorsy type. i ran across this gentlemans website. what a great read! 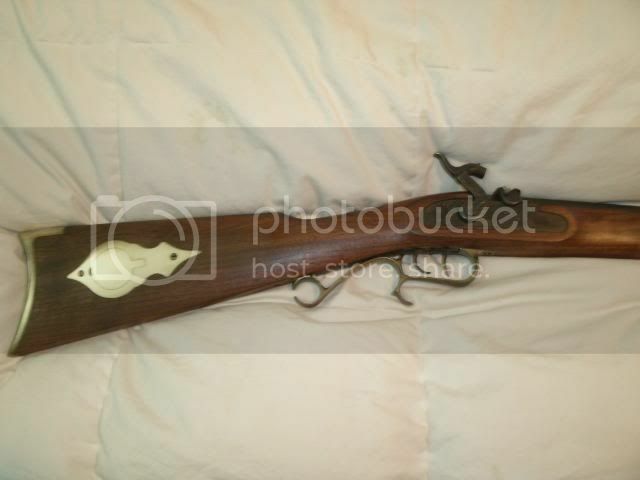 in one article he talks about useing his flintlock rifle to start his charcloth to make his fire. Nice link Daren. The guy was born 200 years too late I love the colonial garb and he has some beautiful black powdwer rifles. I saved the link for future leisure reading but enjoyed his "special turkey" story. His charcloth directions are inline with some on this site. RR, be sure to read it!!!!!! if i've done the math right, Mr. Spencer was born in 1933. (same year as my father, who taught me to shoot and hunt). that would make him 77 years old now. i hope he is still out there walking around his 200 acre farm, giving the squirrels and bunnies what-for. i've read through all his "musings" now, and i'm working on his technical info on blackpowder shooting. i love my blackpowder rifle and will never again hunt with anything else. here in Canada we don't have quite the same level of firearm history as y'all have in the USA. in your "Colonial Days" we were still digging in the ground with a sharp stick. (personally, my ancesters didn't get to this part of the world till 1895). but, i somehow feel just a bit more "right" when i carry my Hawken rifle in the woods while wearing knee-high moccassins. up here we don't have hunting seasons for squirrel and rabbit. they are considered vermin and can be taken at any time of year. Another good read Zelph. He definitely has a knack with the pen! You can almost envision being there. I enjoy hunting in a light rain as it allows the hunter to be very quiet but that works both ways for the hunted The key is being prepared for rain so as not to get soaked from head to toe. I remember one opening day during deer season when it poured the entire day. I went through 3 sets of clothing that day and none of them were obviously "waterproof". In the late afternoon, I evacuated my treestand and took shelter under a rock shelter overlooking the valley below. Nothing was moving that day except the water and it was rushing off the mountains to the creeks below where we were camped. By days end, all campers in the area had to evacuate their campers to higher ground as the water rose 8 feet or more to completely flood the area. My one friend decided to head on home and came to an 1/8 mile section of road that was completely under water. Not the brightest decision, he put his jacked up truck in 4WL and never let off the gas until he made it across. The next day we came to the same spot and like everyone else, had to back the camper for some distance to be able to turn around and then had to figure out the backroads to get us back to our rural route. It was the trip from hell. 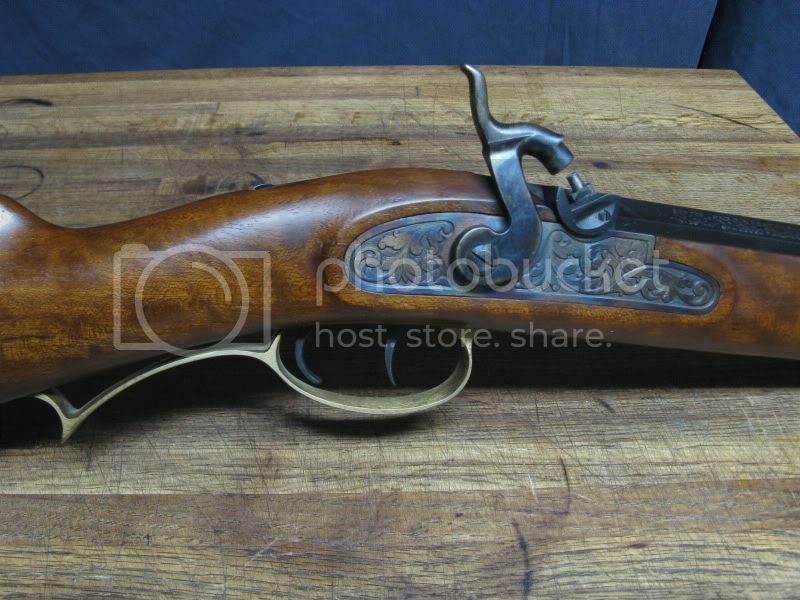 Daren, is your Hawken a flintlock or percussion? He definitely has a knack with the pen! You can almost envision being there. Yes, it was interesting to read the part that was "Zen" like.....................the mist/fog being created while he was watching, kinda lifting him off into another world/ realm of time. And then he's brought back to reality. Ridgerunner wrote: Daren, is your Hawken a flintlock or percussion? she's a percussion. 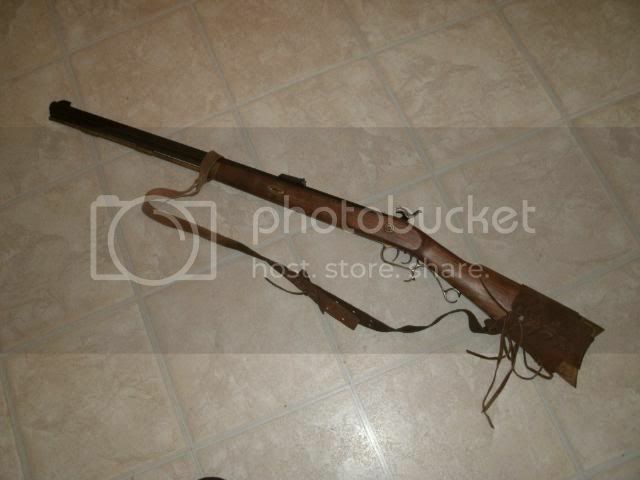 .50 cal, 28" barrel, rifling is 1:48 twist, so i can shoot either patched ball or conicals. here's a pic. i'm very proud of her. i've had this rifle for twenty years and it looks like it just came off the shelf yesterday. I should take more pride in my Hawken I built it from a kit about 25 years ago and instead of blueing the barrel, I decided to brown the barrel to hopefully blend in with my surrounding better without giving a glare. The browning process turned out very nice. I have not hunted witsh it for a three years and my wife had relocated it to the basement . It needs a good cleaning and when I took the sling off, the brass showed a lot of green deposits . It is a ThompsonCenter 50cal. Hawken. I can see myself in the traditional colonial attire but that would end up being one more hobby and expense. I've taken half a dozen deer with this rifle; some with round ball and some with a maxiball. It will definitely get the job done. 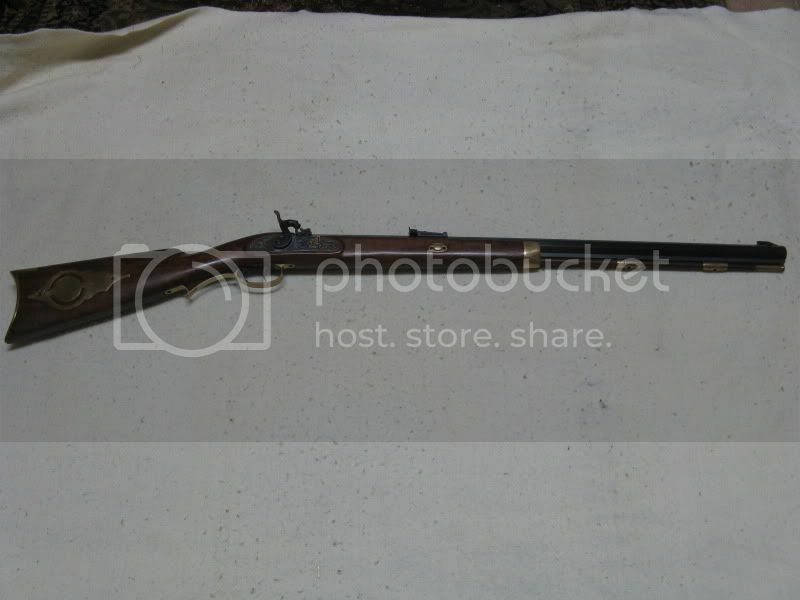 I have never fired shot from it and at one time was considering a smaller caliber muzzleloader for small game. 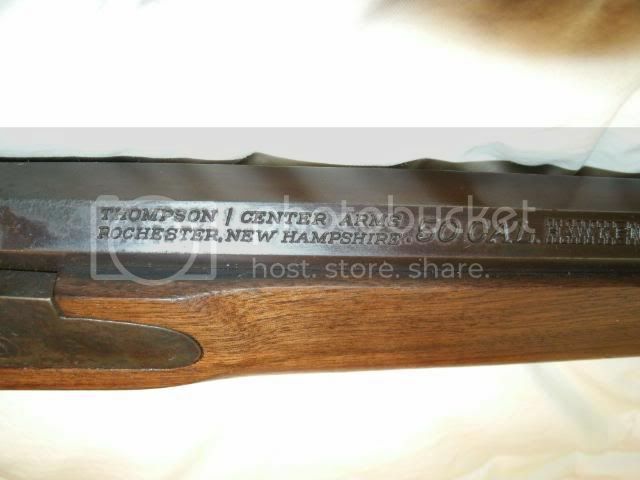 I can remember years ago when you could buy a Hatfield Kentucky long rifle with a curly maple stock for $500-$600 from either Gander mountain or Cabela's but now it would cost you 2 to 3 times that. Now, I think I will give the ol' girl a good cleaning up so it will be ready to pass down to a grandson some day. Daren, did you read his Stearman Biplane page? Notice the car next to the plane in the first picure. He has some nice toys plus a nice sailboat. Ridgerunner wrote: Daren, did you read his Stearman Biplane page? Notice the car next to the plane in the first picure. He has some nice toys plus a nice sailboat. no i haven't got to the airplane and sailing pages yet. i will though. RR, that TC Hawken is a highly sought-after prize! keep her clean and make sure the bore doesn't rust. there are rifles and muskets out there still being used after 200 years of service! and they have iron barrels!! our more modern guns have steel barrels but still need to be looked after.